Above and right: Keegan Swenson (Cannondale Factory Team) on his way to winning the Halloween Cross Utah Cyclocross Series Race #6 on October 27, 2012. Photo: Dave Iltis. Each year in the fall, with our year-end awards, Cycling Utah recognizes members of our cycling community who had stellar seasons on and off the bike. In 2012, an up and coming rider lit the world on fire. Keegan Swenson, an 18 year-old mountain bike rider and road racer from Park City had a year that for almost anyone would be the pinnacle of their career. But we think this is only the beginning. Swenson (Cannondale Factory Racing). The young rider started off the year with two wins in the national level Kenda Cup and US Cup in California in the junior category. He quickly followed that up with an incredible second place at the Pan-Am Championships in Puebla, Mexico. He went on to podium in 3 world cups and finish top 10 in two more. These results have led to his being ranked the number 4 UCI junior in the world. He also finished 5th in the UCI World Championships. If that weren’t enough, he won several other local mountain bike, road bike, and cyclocross races in the pro field. And, that’s not all. Swenson also won all three USA Cycling National Mountain Bike Championships in the Junior 17-18 category in Sun Valley, Idaho in July. He took top honors in the cross country, short track cross country, and super-D. And lastly, he represents the sport well. 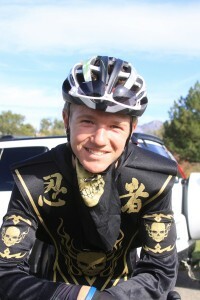 Keegan Swenson is the Cycling Utah Overall Rider of the Year. TJ Eisenhart (FFKR/Velosport Racing) is another up and coming fast, fast rider. The junior also had a fantastic season racing with the US National Team in Europe and the US. He won two stages and the overall in the prestigious UCI 2.1 Tour du Pays de Vaud. He won two stages and the overall in the UCI 2.1 Tour de l’Abitibi in Canada. He was second in the USA Cycling Junior National Time Trial Championship. Along with that came a win and several top 10 finishes locally in the Pro/1/2 field. TJ Eisenhart is our Male Road Racer of the Year. Alison Frye (Ski Utah Cycling) was consistent throughout the year. She won and placed early and late. She was tops at the Antelope Island Road Race, the High Uintas Road Race, and the Utah State Criterium Championships. She also plays the role of a good teammate when needed. This consistency led her to take the overall UCA Series Points title. Alison Frye is our Female Road Racer of the Year. Logan Binggeli (KHS) had a fantastic season. The gravity wizard from St. George won several downhills this year, including Flyin’ Brian in Utah, Whiteface GRT in New York, and the Chile Challenge GRT. He also podiumed throughout the season in several other USA Cycling Pro Gravity Tour events. His consistency in that series was rewarded with the overall season Pro GRT title. He topped off the season with a third place in the Red Bull Rampage in Springdale. Logan Binggeli is our Male Downhill Racer of the Year. Wendy Palmer (Chile Pepper Bike Shop/Shimano/Fox Shox/Sombrio) is a great ambassador for the sport. She also wins races. This year, she won three events at the Pro level in Colorado’s Mountain States Cup and took second in the Bell Wasatch Enduro. Wendy Palmer is our Female Downhill Racer of the Year. Lori Harward has worked tirelessly for the last two years planning and developing the Utah High School Cycling League. This year, all of that work came to fruition with the completion of the first season and four successful mountain bike races that brought together 36 high schools and over 300 kids. The League will bring great things to the future of cycling in Utah. Lori Harward is our Advocate of the Year. Erica Tingey (Rocky Mountain/Kuhl) had a breakout year. She won all four Intermountain Cup races she entered, the Mt. Ogden 50K, the Lambert Park USCS race, and had several other national results. Erica Tingey is our Female Mountain Bike Racer of the Year. Alex Grant (Cannondale Factory Racing) crushes it in the dirt locally and nationally. The 32 year old rider took his fourth straight win in the Park City Point 2 Point, topped the Mt. Ogden 100 K podium, won two Intermountain Cups and the USCS Wasatch Back 50 miler, along with a third place in the Whole Enchilada Enduro. He also finished 5th in the USA Cycling Mountain Bike Marathon National Championships and 2nd in Costa Rica’s La Ruta de los Conquistadores. Alex Grant is our Male Mountain Bike Racer of the Year. Kris Walker (Contender Bicycles) had an even better year in 2011 than she did in 2010. The cyclocross rider from Pocatello, Idaho won the USA Cycling National Championship in the 50-54 category and finished second in the Masters World Championships. Locally, she was second overall in the Utah Cyclocross Series winning four races along the way. Kris Walker is our Female Cyclocross Racer of the Year for the 2011 season. Lew Rollins (Contender Bicycles) raced with riders up to 10 years his junior in the Utah Cyclocross Series where he finished 3rd overall in the 55+ category. He went on to win the 65-69 USA Cycling National Cyclocross Championship and then finished 4th in the UCI Masters World Championships. Lew Rollins is our Male Cyclocross Rider of the Year for the 2011 season. 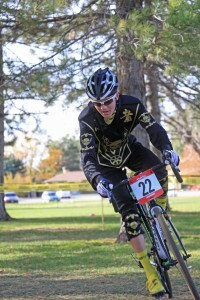 UtahMountainBiking.com topped the Intermountain Cup Series overall team competition again this season. They field riders in almost all categories show up at races throughout the season. They also spend time maintaining trails. UtahMountainBiking.com is our Mountain Bike Team of the Year. FFKR Architects/Team Velo Sport Racing scored points across categories in both the Utah Cycling Association and the Utah Criterium Series season long competition. Outstandingly, they won both the Pro/1/2 competition and the Men’s A Category competition in these two series. They also have a new junior mentoring program. FFKR is our Road Racing Team of the Year. Bonneville. Cycling. Club. There are no parallels in Utah for what they do. Members this year have ridden 142,987 club miles. They organize the Little Red Riding Hood and the ULCER ride along with a number of self-supported centuries. They also have a club commuter challenge to encourage club members to use their bikes in a utilitarian fashion in which they have ridden an additional 29721 miles. Bonneville Cycling Club is our Touring Club of the Year. The Summit Challenge isn’t just another century. The ride raises money for the National Ability Center in Park City. This year, the NAC hosted riders from the Wounded Warrior Project, a national organization that works with vets returning from Desert Storm and Afghanistan and helps them to reintegrate into society with its strong peer to peer network. Riders from the Wounded Warrior Project participated in a group. Those that did the 52 mile ride finished together and kept each other strong throughout. Another rider Jayson had the opportunity to take a hand cycle on the 18 mile ride. He had endured multiple surgeries and mental and emotional pain over the previous 12 months. He felt like he was flying over the 18 miles (despite a broken derailleur) and was visibly ecstatic at the finish. The ride for him seemed life changing. The opportunity that this ride gave to returning vets as well as to other disabled individuals is amazing. Additionally, the ride is well organized and follows beautiful routes throughout Summit County. The Summit Challenge is our Event of the Year. Bryson Perry for winning the Intermountain Cup Series and setting records in two Leadville qualifying events. Anne Perry for taking second in the UCA series and winning the 35-39 USA Cycling 35-39 Road Race National Championship. Stan Swallow for winning the overall at the Utah Summer Games, the Southeast Idaho Senior Games, and the Huntsman Senior Games, and winning the USA Cycling 70-74 Road Race National Championship. Cody Haroldsen for winning the UCA Season Points title. Dave Harward for winning the Utah Crit Series season title. Evan Clouse (age 13) for competing in both the USA Cycling National Road and MTB Championships. Katie Clouse for winning the 11-12 Junior National Mountain Bike Cross Country Championship and placing 2, 3, 4 in the USA Cycling National Championships in the road race, criterium, and time trial respectively in the 10-12 category. Zan Treasure for winning the Utah State Criterium Championship and the USA Cycling Cross County MTB National Championship. Conor O’Leary for having completely recovered from cancer and finishing the Tour of Utah. Amanda Batty for winning the category 2 Utah Downhill Series title and for being an inspiration for other female downhillers. Thanks for reading Cycling Utah for the last 20 years. We hope you enjoy reading it as much as we enjoy bringing it to you. Until next spring, Happy Cycling!